In addition to being one of the most influential figures in the world of modern poetry, highly-regarded American poet, editor and critic Ezra Pound also became one of the literary world's most controversial characters when, in 1945 - at which point he lived in Rome - he was arrested by the U.S. Army after recording hundreds of anti-American, anti-Semitic broadcasts for Italian radio. 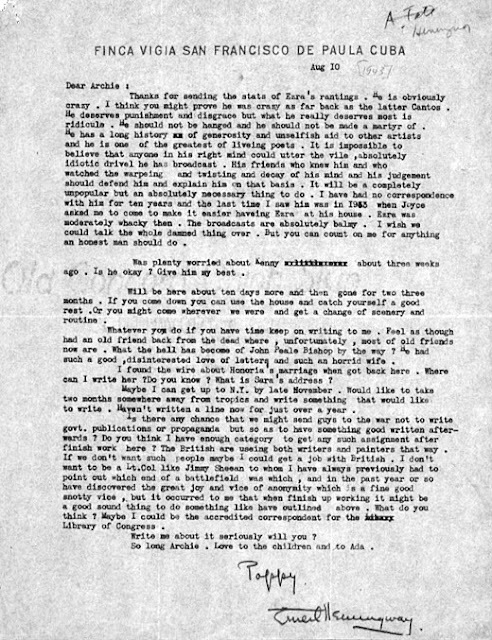 He was subsequently taken back to America where, following an insanity ruling, he spent 13 years in a psychiatric hospital in Washington, D.C.
Below: a letter written in 1943 by a shocked Ernest Hemingway - at one time a very close friend of Pound's and recipient of his invaluable support as a fledgling author - to Archibald MacLeish, in which he discusses the radio broadcasts, and other matters. Transcript follows. Image courtesy of the Library of Congress. Thanks for sending the stats of Ezra's rantings. He is obviously crazy. I think you might prove he was crazy as far back as the latter Cantos. He deserves punishment and disgrace but what he really deserves most is ridicule. He should not be hanged and he should not be made a martyr of. He has a long history of generosity and unselfish aid to other artists and he is one of the greatest living poets. It is impossible to believe that anyone in his right mind could utter the vile, absolutely idiotic drivel he has broadcast. His friends who knew him and who watched the warpeing and twisting and decay of his mind and his judgement should defend him and explain him on that basis. It will be a completely unpopular but an absolutely necessary thing to do. I have had no correspondence with him for ten years and the last time I saw him was in 1933 when Joyce asked me to come to make it easier haveing Ezra at his house. Ezra was moderately whacky then. The broadcasts are absolutely balmy. I wish we could talk the whole damned thing over. But you can count on me for anything an honest man should do. Was plenty worried about Kenny about three weeks ago. Is he okay? Give him my best. Will be here about ten days more and then gone for two three months. If you come down you can use the house and catch yourself a good rest. Or you might come wherever we were and get a change of scenery and routine. Whatever you do if you have time keep on writing me. Feel as though had an old friend back from the dead where, unfortunately, most of old friends now are. What the hell has become of John Peale Bishop by the way? He had such a good, disinterested love of letters and such a horrid wife. I found the wire about Honoria's marriage when got back here. Where can I write her? Do you know? What is Sara's address? Maybe I can get up to N.Y. by late November. Would like to take two months somewhere away from tropics and write something that would like to write. Haven't written a line now for just over a year. Is there any chance that we might send guys to the war not to write govt. publications or propaganda but so as to have something good written afterwards? Do you think I have enough category to get any such assignment after finish work here? The British are useing both writers and painters that way. If we don't want such people maybe I could get a job with the British. I don't want to be a Lt.Col like Jimmy Sheean to whom I have always previously had to point out which end of a battlefield was which, and in the past year or so have discovered the great joy and vice of anonymity which is a fine good snotty vice, but it occurred to me that when finish up working it might be a good sound thing to do something like have outlined above. What do you think? Maybe I could be the accredited correspondent for the Library of Congress. Write me about it seriously will you? So long Archie. Love to the children and to Ada.